The discussion paper focusses on how trust in expertise is placed or refused, highlights the affective dimension of epistemic trust, and discusses the danger of a ‘context collapse’ in digital communication. Experts from academies across Europe reflect on the current situation in which expertise and particularly research and science operate in societies today, and what has changed in relation to trust and trustworthiness. ALLEA published the first issue of a new discussion paper series with the title “Loss of Trust? Loss of Trustworthiness? Truth and Expertise Today”. The paper addresses current discussions on the so-called “post-truth” era and draws attention to the questions of placing and refusing trust in expertise, and how expertise and scientific evidence are being contested in a changing landscape of communication. 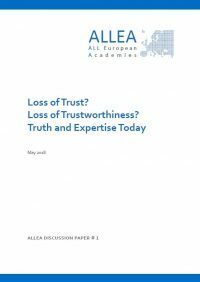 Based on discussions of ALLEA’s international and interdisciplinary Working Group Truth, Trust and Expertise, the paper proposes to refocus the debate on the alleged loss of trust in expertise beyond people’s generic attitudes of trust and mistrust reflected in polls. In doing so, it delves into the question of how people place and refuse trust in expertise, and warns that trust in expertise is “valuable when placed in trustworthy agents and activities, but damaging and costly when misplaced”. Particularly the “affective conditions in which trustworthiness is determined” should be more strongly taken into account. When people place trust in the information provided, they are “taking a chance in trusting someone” – putting themselves at risk and tolerating vulnerability. Judgements on an expert’s trustworthiness thus carry affective (as well as social and political) aspects that determine how people trust expertise. For example, ”in order to understand a lack of trust in children’s vaccines”, the paper suggests that “we need to be aware of communication between experts and their audiences but also of the vulnerability that parents experience in conditions of a perceived or real uncertainty”. The process of placing and refusing trust might also be different from place to place. “Experts and expertise are not monolithic, and we need to engage with the importance of cultural differentiation locally and around the world. Understandably, this can lead to situations where trust is refused not for lack of credibility or confidence, but due to shortcomings in the delivery of the affective and social aspects of judgements of trustworthiness”. “Experts and expertise are not monolithic, and we need to engage with the importance of cultural differentiation locally and around the world. Understandably, this can lead to situations where trust is refused not for lack of credibility or confidence, but due to shortcomings in the delivery of the affective and social aspects of judgements of trustworthiness”. In addition, digital communication has changed the relationship between expertise and the public. The digitisation of information has led to an idea of knowledge as something that can be searched and found on the internet. This online environment often provides “little clarity about who says what in which context and on the basis of what authority or expertise”. The paper warns that new landscapes of communication sometimes imply a “context collapse”: “in an online environment where everything is content, the truthfulness of text, image, and sound can often no longer be determined directly from the context. In addition, whether something is true or trustworthy on social media is far less important than whether it is liked, and what is liked has economic value without any account to expertise”. Finally, another crucial point raised by the paper is that the importance of achieving transparency and accountability whilst still encouraging academic freedom needs to be thought through further. “The initial response to claims that experts were not trustworthy was to regulate them more closely. […] We need to know whether our accountability systems support the intelligent placing and refusing of trust”. Health Inequalities – how do different disciplines deal with it?